I have a love/hate relationship with Pinterest. I get so inspired and excited - and then equally overwhelmed and over it. :) Occasionally I do have some follow through and, for the most part, I've had some successes. I will say, that I'm not really a "pinner"... I'm more of a "screen shotter". I'll see something that looks fun or creative or delicious and I'll screenshot it on my phone instead of pinning it. It's much less organized, but it seems to work for me. One of my most fun pinterest-inspired projects was this flag that I made a couple of summers ago. Follow Andrea's board Momfessionals - Tried and True Recipes on Pinterest. Follow Andrea's board Dinner's Served - Recipes to Try on Pinterest. Follow Andrea's board Child's Play on Pinterest. ... and my kids at school. Follow Andrea's board Stuff for School on Pinterest. I can't wait to see your Pinterest success stories! I love that you have a tried and true recipe board. I am going to have to follow that! I am always afraid to try recipes on Pinterest because I never know exactly how they are going to come out. Also how did you embed your boards?! I have been trying since last night and can't get mine to embed. It shows up in preview and disappears when I try to save. ARG. Oh well. Oh no!!! When I clicked on the board I clicked on the button with the three dots (next to the edit board button). Then I selected "make a widget" and just copied that code into my post. Hope that helps!!! Thanks Andrea! That's what I did, and it only works in preview. For some reason when I save it disappears. Arg! Oh well! Oh my gosh that striped ribbon on your wreath, amazing! Where do you find all that fantastic ribbon? I did a burlap wreath for my pin today. Glad you had this, because that wreath never would have gotten made had you not had this prompt. Although I did it wrong and made one of my pins instead of pinning stuff I like, oops! 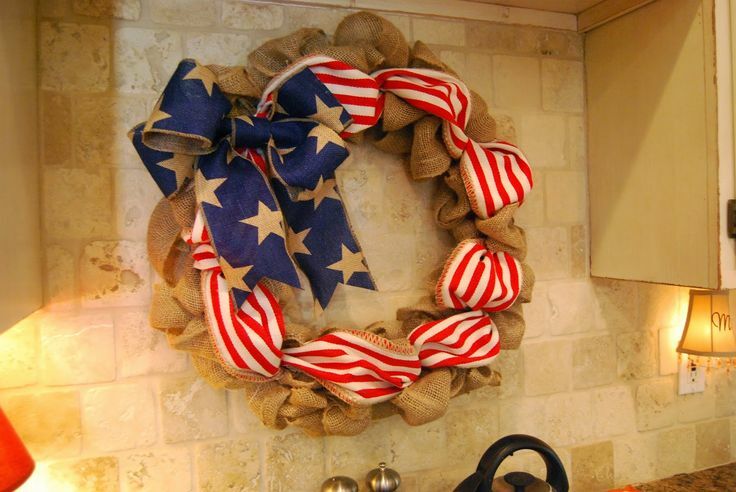 I love that red, white, and blue wreath! I have zero 4th of July decorations, but I think as of this year, I will at least have one! I'm a total screen shorter, too! All of my favorite recipes are screenshots on my phone! It makes grocery shopping easier! Thanks for hosting this!